To celebrate the 100th year of the Organisation of the Swiss Abroad (OSA) as well as the 25th anniversary of the Area for the Swiss Abroad in Brunnen, an exposition called The Fifth Switzerland has been recently opened by the President of the Swiss Confederation Johann Schneider-Amman in Brunnen. 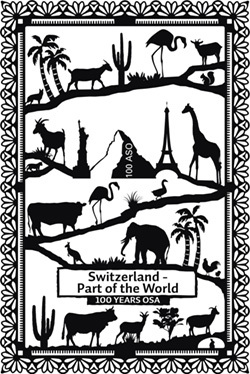 The Organisation of the Swiss Abroad also created a 20 poster exposition to celebrate the 100 years of its existence and the contribution of the Swiss Abroad. The Swiss Club of Victoria is pleased to display the exhibition until the end of 2016 in our club house. Next time you enter the Swiss Club, take your time walking up the stairs to view and learn more about the accomplishments of the 5th Swiss during the past 100 years.